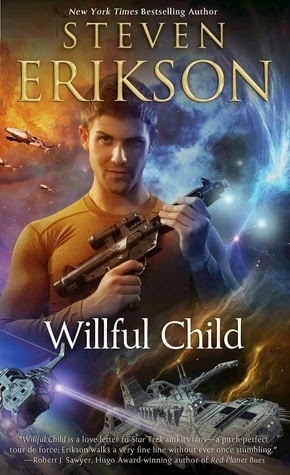 Just to lay my cards on the table, I was excited about the chance to read Willful Child, Steven Erikson's goofy and light-hearted parody of Star Trek. After all, what can be more awesome than a parody of Star Trek, told by the Master of Malaz? My excitement for this novel partly owed to the fact that I grew up on Star Trek (The Next Generation, but I worked my way back to the original series). But more importantly, it owed to the fact that I am a big fan of Malazan Book of the Fallen co-creator Steven Erikson. Erikson is a funny guy. Damn funny. Even his funny bones are funny. I can't remember reading anything (in recent memory, at least) as laugh-out-loudtastic as Midnight Tides, the fifth volume of his Malazan series. His critique of capitalism and his story of the destruction of the Letheri economy, told through the eyes of the comedic duo Tehol Beddict and Bugg, is pure comic genius. But what makes his sense of humor shine is that his characters' silly quips and hilarious conversations punctuate the exceedingly dark mood of the series. Comedic grimdark? Whatever the case, Erikson succeeds in lightening a brooding, dark tale in a way that few other writers can. So I assumed that if anyone could do justice to a parody of Star Trek, Steven Erikson could. Even before picking up the book, I had imagined Tehol Beddict, Bugg, Iskaral Pust, Bauchelain, and Korbal Broach fighting in the bridge of Galaxy Quest. What could be more entertaining? "What is that?" Hadrian demanded. "Extreme magnification, sir! I think it's a thruster!" "Back off a few stops, will you? I think my retinas are on fire." Willful Child, true to Star Trek form, features a plot composed of multiple episodes. In this context, the book's overall structure feels somewhat similar to John Scalzi's Redshirts. Where they differ is in the careful attention Erikson always places on Captain Hadrian Sawbeck, the hero of the story. No other character (outside of Tammy, the rogue AI that commandeers Sawbeck's ship) receives similar attention. 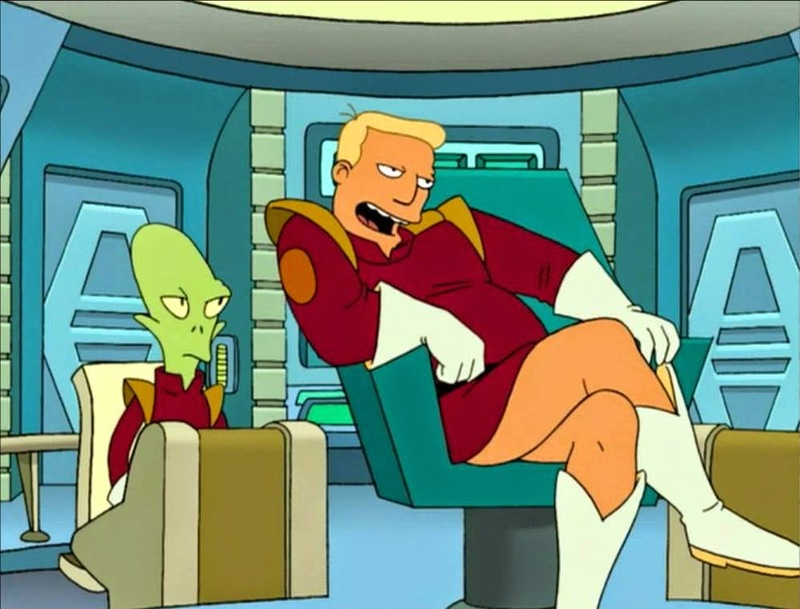 Sawbeck is man who has the intelligence, good looks, and daring of Captain James T. Kirk and the morals, personality, and sense of responsibility of Futurama's Zapp Brannigan. The captain then turned to Galk. "My, that's an impressive piece you've got there. What is it?" The combat specialist hefted the massive, multisectioned, globular, shoulder-locked weapon. "This is an Atomic Laser-Attenuated Defensive Interceptor Multiple-Phase-Shield Last-Stand Forlorn Hope, Mark II, sir." "Outstanding, Galk. What does it shoot?" "It doesn't shoot anything, sir. It stops anything from hitting me." "I see. So, I take it, then, that you haven't got my back." The Varekan frowned. "Good point, sir. I guess I picked wrong again, didn't I?" "Don't let it bother you," Hadrian said, turning to his two security officers. "As you can see, my security detail here... well, one of them's wearing a rapier and the other one appears to have a camera." The woman with the camera strapped round her neck stepped forward. "It's rapid fire, sir." Although Sawbeck is noticeably sexist and has an over-the-top machismo found in the original Star Trek as well as 1950s science fiction writ large, Erikson uses this machismo as a way to poke fun at the space opera genre. The sexism, after all, is often times self-referential. Female characters frequently note that they would not be the target of such sexism were they male. And Sawbeck even has a unique chance to see the world from a woman's viewpoint (not that this would change his worldview in any way). Thus, sexism and cultures of machismo serve as part of Erikson's larger comedic arsenal, to be used and abused to parody the genre as a whole. "You are suggesting, as understand it, a contracted existence, whereby inactivity is encouraged, via a pan-universal shopping network." "Exactly. Buy at the click of a button. I can envisage individual Plog big as planets. Just bear in mind the no-return policy." "Such an existence," the Plog captain mused, "invites drooling apathy, the proliferation of reactionary, stupid opinions and beliefs, a denigration of educational standards, a facile adoration for fads and glam, and an appalling ability to weather the most inane salesmanship imaginable. It is hard to envision a civilization such as the one you describe, Captain." "Hardly. I invite you to peruse Terran history files..."
It is clear that Steven Erikson loves Star Trek, and it is also clear that he had a great time writing this book. Even the overall storyline is a wild ride through the galaxy. Sawbeck gets promoted to Captain after solving the Mishmashi Paradox... and within the space of a few days he commits genocide, loses control of his ship to a rogue AI, travels through enemy space and initiates conflicts against a few major species. All of this Erikson writes with verve and flair. But as much fun as the book is, it still falls flat. The The humor soon grows old, and without it the story lost its grip on me. It was not balanced by sufficient plot twists or a grimdark-esque environment necessary to keep the reader's attention. This is why the comedy of his Malaz world works so well. The humor provides a much needed break from the dread, the violence, the danger, and the agony that is life in Malaz. Penalties: -1 for the humor becoming tiring midway through the book; -1 for no real plot twists or anything else to keep my interest.